What an outstanding article, thank you Paul! Really appreciate the way you frame failure and the exercise to determine who to spend your time with. This is just another wonderful example why I’m a big proponent of you at TheOverwhelmedBrain.com. Thank you Dean. I truly think that learning to deal with failure is important in our path to achieving a top 5% income. Christine. Thank you Dean! I am grateful for your kind words. Glad you stopped by! What a great post Paul and Christine! 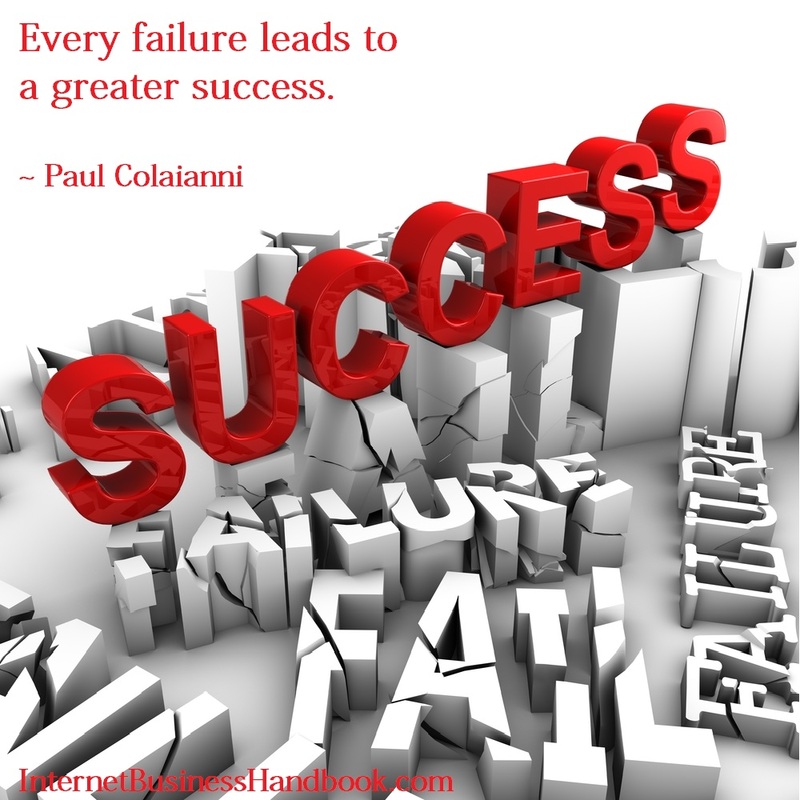 So many people get devastated by failure, yet it is truly the best teacher we have available! Justin, I love your comment about failure being a teacher. I know I have learned a lot from failure, but I sometimes hide from it, as it is so hard to face our failures. It is such a temptation to react negatively rather than in a way that will lead up further along our journey. Bravo! I just had a conversation with a client today who has realized that failure is just part of it and really isn’t failure if there is learning that propels one forward. That was a certainly a win for the long-haul! Paul, your wisdom abounds. Christine, another great choice in selecting a guest blogger! Amber, well done, on helping your client put failure into a more positive perspective. Failure can really inhibit us or propel us forward depending on how it is handled. By helping clients with this you are making such a difference in people’s lives. I agree that Paul was a great guest blogger. I have several wonderful guest bloggers lined up over the next few weeks, but if you know someone that you would love to read, please drop me a line. Ha ha, stop! No, please go on : ). I love that your client got that Amber. Acceptance that failure is part of success will only lead to more success. And you’re right, a win for the long haul! Thanks for your kind words. “Every bump is a stepping stone.” I couldn’t agree more Paul. This is such a powerful topic – thank you so much for writing about it here! Thank you Kate! You are amazing for replying to the post. I appreciate it! Straight and to the point. Surround yourself people who encourage your ideas. I might add one more type of person to this list. As I think about it, it might be a subset of #3. I uniquely covet those who are not only supportive, but can provide real and constructive feedback. We won’t always have the answers and we need to make sure that we don’t ignore feedback that may be critical. Always make sure that you surround yourself with people that will challenge you. For #3s, ask them why it wouldn’t work as well. This will give you a quick sanity check as to them being genuine in their enthusiasm, or just saying yes. So true, that we need to speak to our network and listen to constructive criticism too. It takes wisdom to know when to say, actually I’m going to move ahead and listen and when to take heed. Phil, love your acronym of FAIL. Thanks, for sharing this. Christine. Wow, what a fantastic response. You are my new co-blogger, ha ha! Excellent points, especially about the critical feedback that everyone should definitely want if they are to succeed. Though, you do have to filter that kind of feedback. A critical comment from someone who is normally close-minded doesn’t amount to much. However, a critical comment from someone whom you respect might be worth listening too! Love your reply Phil. Thank you for adding value to this post! tanks so so much, u just strengthen me. brief but mighty message. Corinths media, glad you liked the nessage. Thank you for taking the time to share that Corinths! I am so glad you got something from it. I have learned so much from my failures in the past. I am such a perfectionist that is was hard on my ego to fail, but I picked myself up and learned so much that I wouldn’t change those things, even if I could. Everything happens for a reason and those failures helped me to grow and learn for sure!! Thanks for the post. I can so relate Celest! I am a recovering perfectionist. I’ve lightened up so much, but do focus my perfectionist traits on my entrepreneurial ventures. However, I’ve learned that there is never really failure, only feedback. It is how I grow too. Thank you so much for sharing! So true. I prefer #3 folks in my life. I’ve accepted the fact that there will always be the 1s and 2s but I make the decision to allow more 3s in my life now that I’ve launched a business. I love it Collin. As my passions and outlook towards the future changed, so did many of my friends. Now I have support everywhere I turn. I prefer the 3s in my life too. Failure is part of my everyday life. I learn from it and make the next step better. It comes down to living in an abundant or scarcity mindset. Thinking the glass is half full you know there is always more somewhere. Failing more often and recognizing what you can learn is the cycle that help your transform your vision. Take risks and do things that make you uncomfortable. Wow, great insight Alex! Thank you for that. The risks some people never take typically lead to a life left unchallenged and without much purpose. I love your message: Sometimes you gotta get uncomfortable to make the next step better! Awesome, great advice! Entrepreneurship is exciting! I got very uncomfortable when I started my business again, but I am glad I did. Although, there were critical and negative feedback form my close family members, I was glad to say ” thanks for sharing” and move on. Thanks, Paul. Thanks for sharing. I have heard many entrepreneurs talk about being uncomfortable, as it is when we leave our place of comfort that we can grow the most. Glad the post resonated with you. Wow, I love that you pushed forward! Our family usually wants the best for us, but sometimes they are too scared to change themselves. Then when you change, they either have to adapt to the new you, or react out of fear. Those that adapt will always support you. Those who react from fear, aren’t ready to support you. Being your true self always wins in the end. This, you know. Thank you for sharing!